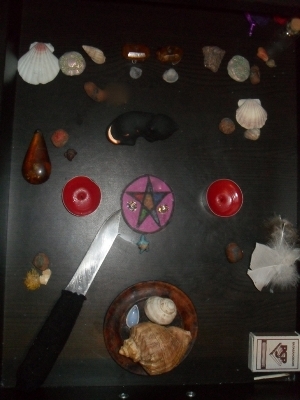 An altar is useful for most (if not all) practitioners of witchcraft, when casting spells, creating a Wiccan magic circle, celebrating holidays, rituals and ceremonies. The altar itself is simply a flat surface, where people can work with magic. 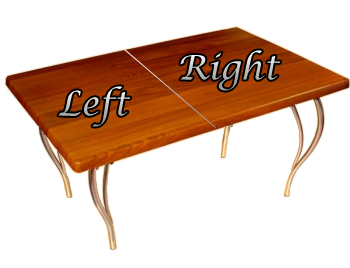 It can be a small table, a wooden box or anything else with a flat surface. The altar should be large enough to contain all the instruments and tools needed to perform rituals. For a more magical aesthetic, green or white colored cloth can be covered on top of the surface, or simply change the cloth and its colors in accordance to the ritual you are performing. You can place various items on the altar, such as flowers, nuts, shells or pebbles during the holidays. There are different tools and instruments that are placed on the altar, each with their own meaning and purpose. Let’s start with basic altar ingredients, and then move to the magical instruments. Candles are good for concentration and increasing energies for the needed spell. Candle colors have their own distinguished meanings. Similar to candles, incense creates a magical atmosphere, helps on focusing on your desired magical practice and helps deliver your intentions to the Universe. You can use any kind of incense, if your spell doesn’t require a specific kind. Crystals and stones have been used for energy concentration for a long time. Megaliths such as cromlechs and dolmens, giant stones which concentrated strong energy and now a powerful place of strength on the altars. Small crystals will suit your altar, such as a variety of quartz crystals (amethyst, citrine, rose quartz, smoky quartz, clear quartz, milky quartz). As crystals can be processed and unprocessed, it is recommended to choose the unprocessed crystals (their natural crystalline form) for better energy concentration. If you wish to make an oracle stone out of different minerals, it is best to work with processed oracle stones. If you don’t happen to have a needed stone, it can always be replaced by a transparent quartz (especially if the stone is a kind of quartz). If you can’t buy a quartz for some reason, pebbles act as a replacement. Search for stones of unusual forms, shapes and colors. Spells often make use of natural ingredients, such as grass, stones, crystals and feathers, each with its own special magical energy. It is good to remember to treat nature with the respect it deserves, even when collecting grass and plants. Magical instruments are very important to witches because they help move to a different level of consciousness. The instruments hold their own charged energy of the Universe, and are helpful companions when casting spells or working with magic. They are not mandatory, as you can practice magic without any instrument – but they do serve a purpose in helping you visualize, strengthen your faith and connect you with ancient customs. Note: If you are a beginner in magic and witchcraft, it might not be a good idea to try to buy all of the instruments at once. It is best to gradually get the needed instruments, while understanding each one to the fullest. Also, don’t purchase instruments which you don’t like or disturb you – choose only the things that you are fond of. A magical dagger, traditionally with a black handle. Witches don’t use the athame to cut materials or foods, but rather use it for ritual purposes marking things in the air or ground. Athame is used to create a magic circle, for concentration, evocation, directing mental energy and force. It is associated with the Air element, and its direction is East. A magic wand or wooden stick is a tool usually made out of wood or metal and is associated with the element of Fire, perhaps because of the ancient people’s faith in wood being able to contain fire within itself. The wand might have a crystal or stone attached to it. Athame and wand are considered phallic symbols and are connected to the masculine principle. The wand is an instrument of visualization, inspiration, creation of magical energy. It is used to appeal to the Goddess. An altar pentacle is a flat disk with a pentagram (five-pointed star) drawn on one side of it. It is a symbol of the Earth. Pentacles can be made out of metal, stone, clay or wood. If you can’t find a pentacle for your altar, specially selected stones can take its place. The pentacle is not often used in spells, but placing ingredients on it will increase their strength. A chalice or goblet is a symbol of the Water element. Water, wine or juice is poured into the chalice during rituals so that witches could drink in honor of the Goddess. The chalice represents the womb of the Goddess, and is associated with the water of life, as well as the true inner wisdom of the Goddess. As with the chalice, cauldron represents the womb of the Goddess. During the Wheel of the Year celebrations, the cauldron is filled with water and flowers, and sometimes a candle is placed inside of it. The cauldron is also associated with the dark side of the Goddess and the Spirit. It can be used to burn ingredients during spells, or predict the future by filling it with water. Cauldrons are usually made out of cast iron, with a rounded shape and three legs. The censer is used in spells or during consecration, when the practitioner carries the object through the smoke of incense to attract the energy of Air, or when cleansing the magic circle by passing the censer in a clockwise direction. A ceramic jar can be used instead of a censer, after its bottom is strewn with a layer of sand or salt. This will slow down the excessive heat and prevent cracking of the jar. You can also use incense in the form of sticks, cones and so on. A magical dagger with a white handle, which is used to carve shapes on pieces of wood and candles, cut flowers and herbs for magical work or cut and prepare a magic wand. The boline is not used in rituals themselves. The broom is used for the symbolic sweeping of the space inside the circle, removing negative energies through visualization. Brooms are most often made out of birch because of its cleansing symbolism. The broom symbolizes fertility, cleansing and isn’t connected directly to any element. Bells are associated with the Goddess and the element of Air. Water and salt are the personification of the Water and Earth elements, and are commonly used to cleanse the magic circle. Salt dissolves in water and then sprayed over the circle boundaries. Salt was dedicated to Aphrodite and was a very valuable substance before the invention of the refrigerator. You can take a salt bath before a ritual for self purification. Playing a musical instrument or simply putting music on during your magic practice can help you concentrate and move to a different level of consciousness. You can buy a small drum, tam-tam or tambourine and play a rhythm. It will take some practice to get the rhythm right and to immerse yourself in the music and magic. If you don’t have musical instruments, you can put on a relevant music CD, something that expresses your inner spiritual self. You can easily make clothes by yourself to wear during ceremonies and rituals. Take an old sheet, cut a hole for the head and sew the edges (shorten where necessary). You can also try to dress in monochromatic clothes. Make sure you don’t wear your ritual clothes for anything else than working with magic. When you wear such clothes, you let your subconscious know that you are now working with magic. If you don’t happen to find a Goddess statue, you can use a stone with a natural hole in it as a replacement. Shells or colored candle (white, green or silver) can be used instead as well. The statue of the God can be replaced with a knob, horn, acorn or a colored candle (red, gold, yellow or white). You can also use simple figurines of man, woman or an animal as a personification to dedicate to the Goddess and God. The Gods can be also represented by two quartz crystals, one of which must be rough with natural edges to represent the God, and the second one processed as a pebble, to represent the Goddess.